Remaining inventory is available exclusively through Amazon.com. There are no other authorized third-party sellers. The Forever Filter is a reusable filter for your Drinkwell® Avalon, Pagoda or Sedona pet fountain. When it’s time to change the filter, simply empty and rinse the canister, fill it with fresh activated carbon, and return it to the fountain. That’s it! 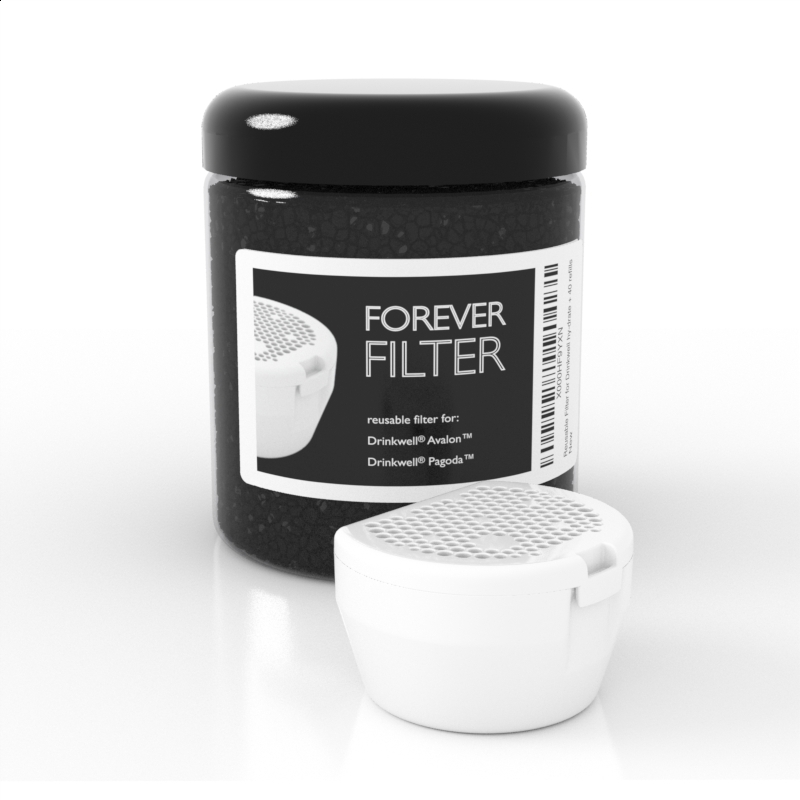 The Forever Filter lets you keep your fountain running at a fraction of the cost. 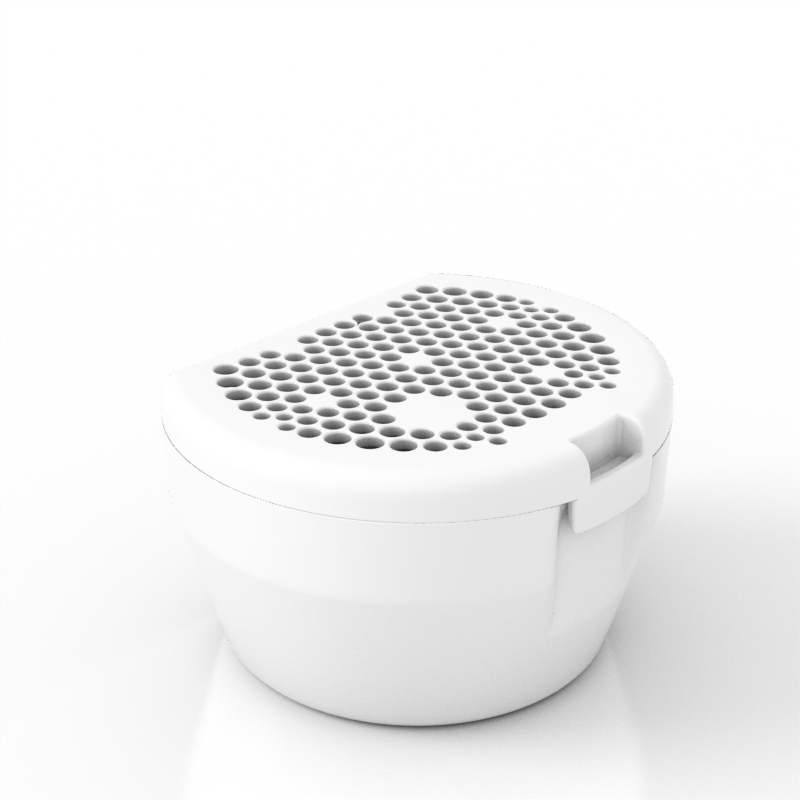 Water filters keep water fresh in two ways: a mesh captures large particles and a few teaspoons of activated carbon absorb some of the foul-tasting impurities. Disposable filters currently on the market are sealed plastic cartridges with a mesh fabric that holds in a few teaspoons of carbon. When the mesh gets clogged and the carbon becomes saturated, you have to throw out the entire cartridge. With the Forever Filter you pay for the filter once, and the only thing you replace is also the least expensive part of the filter: the carbon. The Forever Filter comes with enough carbon for 10 refills. When you run out of the included carbon, you can buy more at a pet store or online. $6 of store-bought carbon will last almost 1 year if you change it every 2 weeks. In fact, it’s so inexpensive you can choose to change it as often as you want without worrying about the added cost. Includes enough carbon for 10 refills. In response to customer feedback, this model of filter now ships with premium pelletized carbon, which virtually eliminates the problem of carbon dust and particles ending up in the fountain bowl. Dispose of used carbon. Consider adding it to compost or your garden! Clean the filter. Rinse well. Be sure to clean the meshes. If necessary, clean with soap and water, or place in the top rack of the dishwasher. Close filter lid, making sure it snaps shut. Rinse filter before use. Activated carbon is usually very dusty. Hold filter under a faucet and run some water through it to wash off the carbon dust. Insert filter into the filter housing. Reassemble the fountain as usual. Generally you will need to refill the filter every 2 weeks. Adjust this interval according to your pet’s preference and your fountain’s performance. Activated carbon is a common aquarium supply found in most pet stores and on Amazon.com. We recommend Acurel Extreme. You won’t need much carbon. A 23 oz jug of Acurel Extreme will last almost 1 year and costs around $9.